August | 2016 | Home: Free Sociology! In my younger days, after working a variety of odd jobs and building up a a bit of savings, I set out with my dog in a little red truck with a cap on the back to travel across North America. I didn’t really know the term “gap year” at the time, but that’s kind of what it ended up being, tucked between my undergraduate degree, a little more schooling, and a lengthy career as a graduate student. I enjoyed life on the road, often pulling up and sleeping in the back of the truck at campgrounds and out-of-the-way parking lots across the USA. I had a campstove for cooking and carried plenty of water. Whenever I wanted, I could roll out my sleeping bag in the back, with a pad beneath it, and I slept reasonably comfortably. At least once I was asked to move along by concerned police officers. * they did not have a place of their own where they could expect to stay for more than 30 days and if they did not pay rent. For example, someone who stayed in a garage would be considered homeless if they did not pay rent, even if they considered the garage to be their home. Emergency shelters are not considered permanent housing, thus shelter clients are included in the homeless population. Someone who stayed at a friend’s place where they did not pay rent (i.e. couch surfer) is also considered homeless as they do not have security of tenure. Seems pretty clear: living in vehicles = homelessness (especially without paying rent). So what to make of the many folks who live in vehicles that were built for living? They don’t fit well into municipal definitions of home, but in many cases they also don’t quite fit our preconceptions of homelessness. My truck was admittedly borderline, but its little shell had windows and was made to support camping. My buddy’s van was even better equipped. Pieces in the Vancouver Sun and the Globe & Mail (the latter by a former student, Wanyee Li), both speak to the attractiveness of these alternative forms of living for some people. But in many cases, these are folks who straddle the line between homelessness and home. Strikingly, it doesn’t take all that much more, symbolically speaking, to shove people more clearly into the “home on the road” camp and out of the “homeless” camp. My wonderful sister and her family (including husband, two girls, and two dogs) recently embarked on an adventure, buying a 31 foot Winnebago Vista. They were written up, together with two other intrepid families, in this piece in the Baltimore Sun (Permanent copy complete with photos archived here). Pretty awesome. And ok, I’ll admit it: mostly I just wanted to blog about my sister. But there’s also an interesting point here: I don’t think any observer would reasonably consider my sister and her family homeless. Yet note how they’re coupled with a family living in tighter and somewhat cheaper circumstances. Does the boundary grow fuzzier again when we move from RVs to Vans? Does it matter that it’s a touring van attached to a band? Or if van residents only become homeless when their vans become mostly stationary, like the one my friend lived in, then how should we think about the greater stability of a stationary residence contributing to a definition of homelessness? These are all tricky questions, and they occur mostly at the margins. To be very clear, in raising these questions I’m not doubting the problem of homelessness in Vancouver or expressing skepticism concerning local homeless counts. We’ve got real problems here. BUT, all that said, we also have a problem in restricting what we consider decent housing and thereby diminishing diversity by legal fiat. To return to a major theme: this is a BIG problem when it comes to locking away land for single-family detached houses and such houses alone. But it’s also a problem when we fail to consider and make room for alternative forms of homes that people might want to try, including life on the road. The Death and Life of the Single-Family House: available for pre-sale! Did you know that Vancouver has moved the fastest and the furthest away from reliance upon single-family houses of any metropolis in North America? Only Montreal competes for the title of least house-dependent. I have a new book coming out that traces the history of Vancouver’s dramatic transformation and describes its effects on residents, as detailed by interviews with locals. More broadly, the book makes the case that this is mostly a positive development, primarily dependent upon regulatory innovation, that has many lessons for other metropolitan areas across the continent. 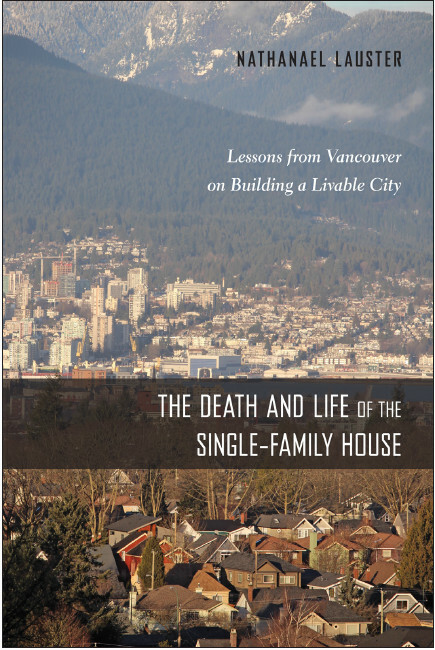 The book, The Death and Life of the Single-Family House: Lessons from Vancouver on Building a Livable City, hits shelves on October 16th, but I’m happy to announce that it’s now available for pre-sale! It will be part of the broader series by Temple University Press on Urban Life, Landscape, and Policy. Click on the image link to see the promotional flyer, complete with a pre-sale discount code! Please feel free to distribute the flyer widely! The book is also now available for pre-sale via Amazon (Canada) , Amazon (USA), Bibliovault, and other related book sites, but you may not get the discount via these locations! Who is an “average voter”? What does Mrs. Clinton’s presidential nomination mean to average voters, die-hard Democrats and Bernie or Busters? We asked a few here in Philadelphia. I suppose, as I read through, I can pick out a few of the “die-hard Democrats” and the “Bernie or Busters,” but who is supposed to be an “average voter?” And what does that even mean? In a straightforward statistical sense, we can identify who falls into the group of “modal voters,” at least once we have a set of votes. Modal voters would include all of those who voted for the candidate who won the most votes. If we can arrange candidates on a scale (say left-to-right), then we can also come up with a population of voters that we could draw from in order to select a “median voter.” But in each case, if we wanted to find someone to exemplify the modal or median voter, we’d still have to randomly select from all of the possible people that would fill in that category. To put it mildly, there is a lot of diversity there. But finding someone to exemplify an “average voter?” I have no idea how that might be accomplished. Here I think Emma Roller actually means something different. She’s looking for someone who isn’t selected into the streets of Philadelphia as either a Democratic delegate (like Ms. Ali, her first interviewee) or a Bernie-or-Bust protester (like Ms. Ernst or Mr. Hainer), presumably making them more “average” in terms of their level of political participation. Still, it’s tricky to pick these people out. Do we count Ms. Driver and Ms. Sanabria (two of my favorite interviewees)? Ms. Driver said she and Ms. Sanabria spontaneously decided to rent a car and drive to Philadelphia from Washington for Mrs. Clinton’s nomination after watching Michelle Obama’s speech on Monday night. Ms. Sanabria texted her. That sounds like a pretty unusual (and kind of awesomely spontaneous) level of political participation. But even the people who seem more “normal” in their orientation to politics, like Mr. Schumann, are also really wacky (as she notes, at 59, “Mr. Schumann is the oldest person I’ve seen playing Pokémon Go” – making him my another of my favorite interviewees even though I really, really don’t play Pokémon Go). As a matter of fact, most people are kind of wacky, as I’ve often witnessed in my own interviews with people. It’s part of what makes the job of sociologist fun. And the US, like Canada, is a diverse country, full of idiosyncratic wackiness. So what use is it attempting to find an example of anyone average? To return to a theme, one reason I like the kind of thing we see in Ms. Roller’s piece is that good stories attached to real people quickly remind us just how devoid of human messiness our statistical averages may be. That’s not to say that the statistical stuff is wrong and we should all resort to “voice of the street” analyses. Indeed, statistics is ultimately how we’ll figure out who is going to win this election. But if you really want to get into how or why someone wins this election, the stories help remind us of the underlying diversity and complexity of peoples’ decision-making processes.